A large percentage of content on this website is available thanks to the efforts of former pastor of Calvary Community Church, Dr. Hank Lindstrom. Dr. Lindstrom was born and raised in Miami, Florida and graduated from Miami Edison Senior High. Dr. Lindstrom graduated from the University of Florida in Gainesville in a five year Electrical Engineering program. Dr. Lindstrom then entered into his Biblical Studies at Florida Bible College in Miami. He then moved to Tampa and married in 1965. Dr. Lindstrom married Jeanette Lindstrom and has one daughter. Their son Matthew was killed in an automobile accident at just 16 years of age. For the next 10 years after moving to Tampa in 1965. Dr. Lindstrom was actively founding and directing Bible Study clubs in most every high school in Hillsborough county and directed the Tampa Youth Ranch Bible Studies attended by hundreds of high school students including 'Hulk Hogan'. Hulk Hogan trusted Jesus Christ at the age of thirteen in Dr. Lindstrom's meetings. 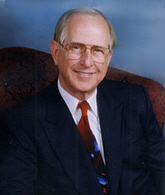 In 1966 Dr. Lindstrom became the Pastor of Calvary Community Church. Calvary Community Church of Tampa, was incorporated in June of 1966. Dr. Lindstrom had the longest continuously running weekly television program on the Time/Warner Access channel in Hillsborough County [over 20 years]. Also he was heard on Christian radio in the Tampa Bay area for many years. Traveling to the Bible lands enhanced his understanding of the Scriptures. Dr. Lindstrom traveled fourteen times to Israel, the Middle East, and Europe. Dr. Lindstrom was a Bible instructor with the Moody Bible Institute of Chicago. Calvary Community Church was an extension location offering Bible courses for credit with the Moody Bible Institute. Dr. Lindstrom was on the Moody Bible Institute faculty for eleven years. Dr. Lindstrom also worked as a Bible teacher and chaplain to many major league baseball teams and also served as chapel speaker to several NFL football teams. Dr. Lindstrom believes the Bible to be the inspired Word of God and compiled a list of some the most significant 'Beliefs That Matter'. Dr. Hank Lindstrom went home to be with the Lord on Oct. 13, 2008.